I was in Killeen last week presenting COLOR YOUR WOLRD, a school assembly program on reading and diversity. It's a great program, and a wonderful way to start the year off right. The kids learn about respect and standing up for what's right. During lunch I was talking to the librarian there about the show that I'm writing for this coming summer. The theme is "Sail Away with a Book" and my show is called "Set Sail". It is a program about the writing process, but I told her I wasn't too sure what areas I wanted to cover. So she pulled out a collection of ideas including a program they use called "6+1". She even had a bibliography of potential books that tied into these concepts, complete with summaries of each book. You have to LOVE librarians! They are such resources of information. I finished the programs that day and remembered that the highlight of the whole Color Your World Show (the program I was presenting at her school) is a song and a book that was suggested to me by another librarian years earlier. It's great when you can get your customers to do the hardest part of your job for you. Thank you, to librarians everywhere, but particularly to those of you who have hired me and helped me improve the lives of students. I was doing a school assembly program last week performing the GO WILD program on science and reading. After the program the counselor came up to me and said "You just skewed my testing for the start of the year! I ask some logical thinking questions and your program gave everyone a leg up on the diagnostic!" Now, as a former special ed. teacher, I can assure you that I do not set out to sabotage any diagnostic instrument. However, I must admit that I felt a certain amount of pride at having ruined her question bank. I mean, ultimately, my real goal is to skew test results. I want the kids at the schools where I present to have an almost unfair advantage when it comes to testing, logical thinking skills, and the ability to think through problems and find workable solutions. Every teacher should have those same goals. So to the schools in north central Texas, I apologize for making you find new diagnostic testing instruments, but I am glad that we were able to bump the whole school up a few notches during the first week back at school! What a great way to start off the year! P.S. If you are interested in having similar programs at YOUR school, visit www.JulianFranklin.com or drop me a line. I'd love to help you out, too. It’s been over a week since I last posted and I’ve got a lot of catching up to do. I just got back from one of the coolest professional conferences I’ve ever attended. It is a four-day event for children’s performers called KIDabra. I’ve lectured there for the last few years and have been attending for even longer. It’s a great convention. This year I took my family including my beautiful daughter, Madeleine. You can imagine the attention she got at a convention of children’s performers. She left after seeing a couple of hundred magic tricks, speaking with no fewer than 27 puppets, receiving about 22 napkin roses, and about 391 balloon animals. She loved every minute of it. But now I’ll tell you that one of the highlights of my trip was seeing a black bear in the wild. We were hiking in the Smoky Mountains with my wife in the lead when she turned and yelled “There’s a bear!” She then very instinctively grabbed our daughter, turned her to be facing toward a tree and then wrapped herself around our daughter to protect her. I don’t know if that’s the right thing to do, but my wife sure did it fast like she knew what she was doing. Meanwhile I grabbed the camera and started running toward the bear to get a good picture. This, by the way is NOT the right thing to do. Oh, yeah. Bears maul people. They are strong and this one was lean. He looked hungry. He crossed the trail and went up the hill. I watched him from what I hoped was a safe distance, about 30 yards. He didn’t seem the least bit interested in me (thank goodness). He just slowly sauntered up the hill, stopping once to glance back at me before continuing up the hill. The real bummer is that I never got a good photo. Hoodwinked is an animated motion picture that is an example of everything children's entertainment should strive to become. The movie is based on the Red Riding Hood story re-told as a modern tale. But it is SOOooo much more. For starters, there are many layers of humor that strike adults as well as children. This is nothing new in children's entertainment, but it is done particularly well in this movie. What I really like about Hoodwinked, however, is the very inventive and creative way that the story is told from several different perspectives as a "mystery" seems to unfold in the telling. As each character's story is told you aren't sure if you are getting closer to the truth or farther away. And then, just when things couldn't get any weirder or funnier, the story comes to a conclusion that makes sense of everything in a very satisfying way. I won't say anything else because I want to preserve the "whodunit" for those who haven't seen the movie yet. I will tell you that you will enjoy this movie, even if you have no children. It is funny and engaging in a way that few movies are anymore. If you are a children's performer (as I am) then you owe it to yourself to rend this movie and study it. Notice how the humor is kept clean and yet riotously funny? Notice how the reference to pop culture are tossed out without much fan fare, to be enjoyed by those who get it, but not to become stumbling blocks for those who didn't? You don't want your audience to spend time wondering about the joke they didn't get. Particularly, pay attention to the creative way that an old, worn-out tale (Little Red Riding Hood) has been given new life through a little bit of creativity and imagination. My very first job as a teacher, I worked for a principal who had given me a paddling 12 years before. I kept hoping that he didn't remember me, but I can't imagine that he could have forgotten. I had received corporal punishment from him on more than one occasion. When I was a student, I was not the best kid in class. I wasn't BAD, but I was definitely not the teacher's pet. The reason I bring this up is because of a fun e-mail I got recently from the director of Library Services in a Texas School district. He saw my school assembly program and wanted to share it with all the schools in his district. He passed on the word of my program to some of the school officials and they all wanted more information. "This guy is such a showman that I'm sure he was a thorn in the side of many teachers"
Okay Steve. So you're more right than you probably knew. However, I'm making up for it now. I spend my life educating children all over the country and inspiring them to read more, learn more, and become more. I motivate them to explore the learning process through self-directed learning, reading books on any subject they love and care about. It might not make up for the underground newspaper I published my junior year ("The Harlequin", I got three issues out before being shut down by "the man"), nor does it reverse the fact that I organized a walk-out of our Political Science class. I had no good reason for the walk-out, other than we had been discussing them in class and it seemed like a fun thing to try. When the teacher left to get some coffee, I saw the opportunity and I grabbed it. These things are done-and-over long ago. But I'm still paying retribution and making good on my debt to educators everywhere. And I intend to continue to do so. My last few posts have been about how the summer library club reading program in Texas has changed my life and how it continues to do so each new year that I'm involved with the program. 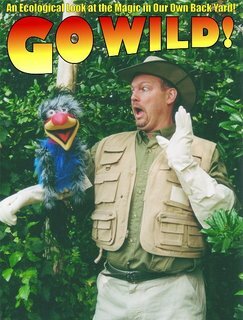 This post is about the summer of 2005, when the theme established by The Texas State Library was "Go Wild: Read!" By the time 2005 rolled around I had learned a bit about costuming. Summer Library Programs in Texas are held in the summer…in Texas. It gets HOT!! No longer was I wearing trench coats, no matter how cool they looked in promo photos. So for the 2005 theme I dressed like a safari explorer. Because I take my summer reading shows into the public schools and perform school assembly programs that promote reading, I also put an educational message into my programs. "Go Wild!" is about recycling and the scientific process. With the state mandated TAKS now testing Science, this has been a VERY popular program! So, several times a day, dozens of times a week, and hundreds of times over the course of a school year, I teach about the importance of recycling. Now, I've been a recycler for as long as I can remember. I paid for most of my gasoline in college by recycling all the aluminum beer cans consumed by the guys in my dorm. But when you lecture about something day in and day out, any inconsistencies in your own life begin to haunt you. Even when I knew no one was looking, I just couldn't bring myself to throw out the tiny glass jelly jar. Empty soda cans consumed on the road were usually tossed in a trash can when I stopped for gas. Now I trucked them all home to recycle. It seems little, but the fact is, that every year I perform, I learn more as I teach and I always grow as a human being as well as a performer and educator. I'm on a roll here. I've been writing about all the ways that the Summer Reading Club in Texas, created by The Texas State Library, and hosted by libraries all over Texas, has changed my life and continues to change my life in simple, but profound ways each year. This post is about what happened in 2004 when the summer reading theme in Texas was "Color Your World". I created a show with the same name, in which I dress like a crazy artist and my dragon puppet (named Meihoo) magically steals color from the world. Only through an understanding we get from books found in the library are we able to convince Meihoo of the error of his ways. I wanted to create a show about bullying and diversity, but as a former special education teacher I wanted to address diversity in a way that hadn't been explored in as much depth as many other forms of diversity. I wanted to address the diverse abilities and unique capabilities of different children. So yes, we talk about different clothes, different foods that people eat, different languages, different cultures, but we also focus on how similar we all are. We talk about how people love to read and I bring out a book in Braille and show the kids how children read who are unable to see printed words. I hold a book from the Moses series by Issac Millman. These books are about a deaf child who visits various places and each book teaches some sign language. We cover children in wheel chairs and those who use walkers, too. In the end I sing a song, and this is where the real growth for me came. I am not a singer. I have never (prior to 2004) had voice lessons, sung in a choir, or in any other way made any real attempt to sing. But here I was, singing a very powerful song that almost all the children can relate to. Was it scary? Yeah. Was it a risk for me to include this in my show? A HUGE risk! Was it worth it? When I see fifth graders watching the show and leave with red eyes and wet cheeks, and I see them look at each other in a different way, then yeah, there's no doubt it was worth it.